Literary dreams do come true! Visiting Nijo Castle in Kyoto was on my must-see list after reading Across the Nightingale Floor (and the rest of the Tales of the Otori series) and it didn’t disappoint. 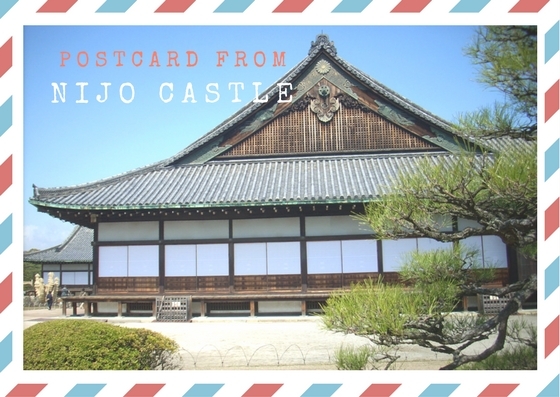 Built in 1603 by the first shogun of the Edo period, the castle grounds are divided into two levels of defence, which are surrounded by gardens. The Honmaru (first level) and Ninomaru (second level) are contained within a stone-walled compound surrounded by a moat, with Ninomaru Palace in the inner area. The timber palace is a UNESCO World Heritage site, with tatami mats, detailed, stunning paintings on sliding paper doors and elaborately decorated ceilings. Several separate buildings are connected by wide corridors and it’s these walkways that I was keen to see. Or hear…. The day I visited, I was joined by several hundred others on the nightingale floors. Despite spending far too long waiting for groups to disappear so I could dance across the timbers to the song of the protector-bird, they were too many in number and I heard neither squeak nor song. Maybe that’s the real reason intruders stepped out onto the corridors in the dead of night? Musical appreciation, rather than political assassination?